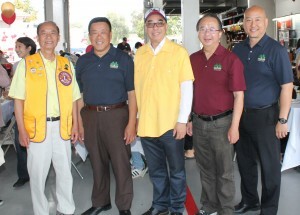 Lion Club member and former Monterey Park Mayor Anthony Wong, City Clerk Vince Chang, Lion Club member and Mayor Stephen Lam, Mayor Pro Tem Peter Chan and Councilmember Hans Liang welcomed the guests to the Annual Lions Club Breakfast and Fire Service Day held at Station 61 on May 19th. 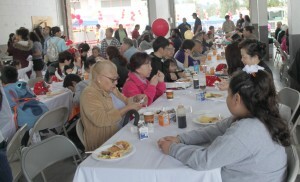 Over 800 hungry people enjoyed the delicious breakfast of sausages and pancakes. 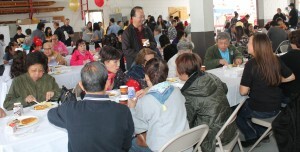 They shared long tables with their friends and neighbors to support the Lions campaign to protect the eyesight of the students in the Monterey Park’s public schools. 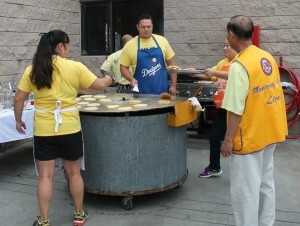 The dedicated cooks flipped pancakes on the unusual round grill and grilled sausages the old fashion way in the outside kitchen. 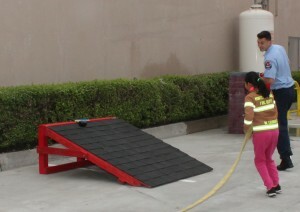 Young firefighters dressed for action carried the ladder, knocked on the roof and put out the fire to the delight of the family members. 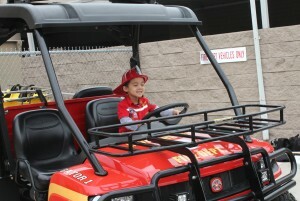 They sat in various fire vehicles as their proud parents and grandparents took pictures as memories of the day. 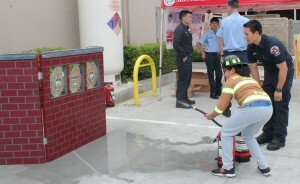 They sported red fire helmets and proudly wore their badges of honor. 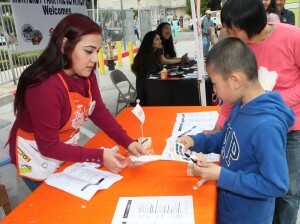 Members of the Home Depot staff helped the youngsters build boats. 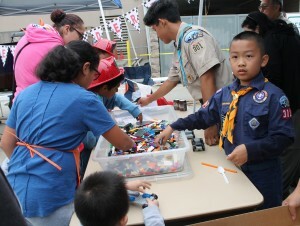 Boy Scouts helped the little ones create Lego cars and watched them race down the speedway. 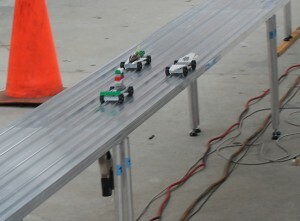 This was a new attraction for the event. 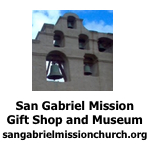 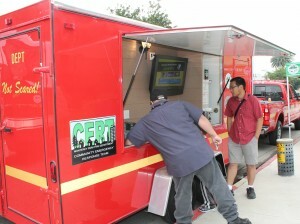 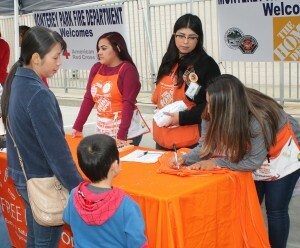 The event featured many information booths for the residents. 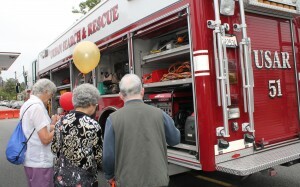 The fire department filled the street with their vehicles for the guests to inspect including the Search and Rescue truck, the Cert Trailer, a Paramedic truck and Quint 61, the Hook and Ladder truck. 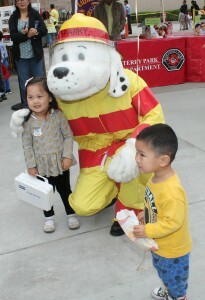 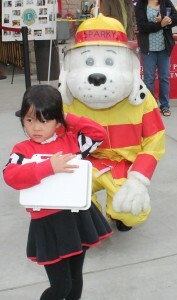 Children of all ages posed for picture with the famous Sparky the Fire Dog. 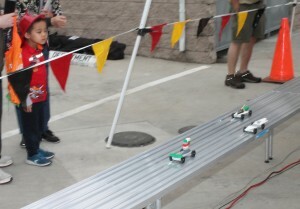 Jason and Calvin joined in the celebration. 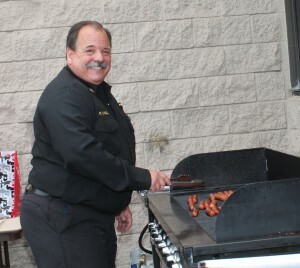 Fire Chief Khail manned the grill and cooked the hotdogs for the hungry guests. 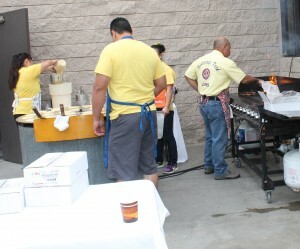 They lined up to enjoy hot dogs with chips, soft drinks, smoothies and cotton candy. 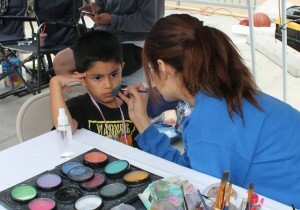 Some children decided to have their face painted with their favorite hero, flower or more. 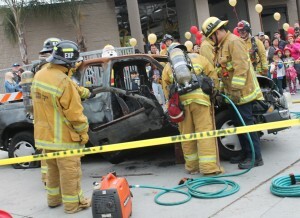 Captain Birrell introduced firefighters Cacciatori and Chang with reserve firefighters Lawson, Loell, Dinn and Edwards to the audience. 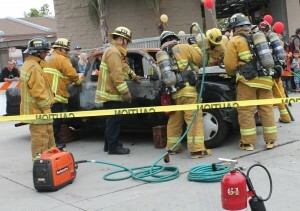 They dress in full fire gear to answer the call to rescue victims of a car crash. 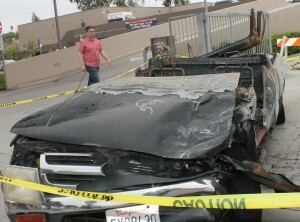 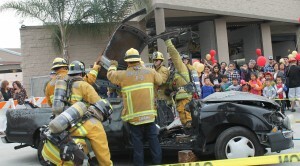 They demonstrated the “Jaws of Life” to open up a crushed car to remove the victims. 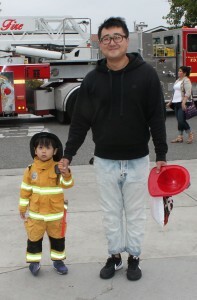 The audience was excited to watch them dress up in full gear and perform a rescue. 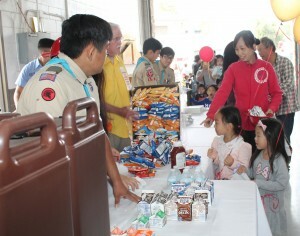 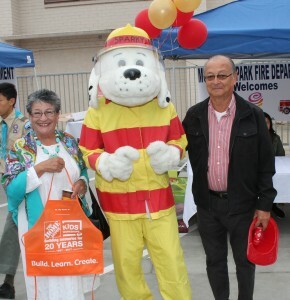 The Lions Breakfast and Fire Service Day in Monterey Park was well attended and enjoyed by many residents and their guests.